I have always been fascinated by painted eggs; they are so delicate and beautiful to look at. When you complete this project you will be very proud of your accomplishment! 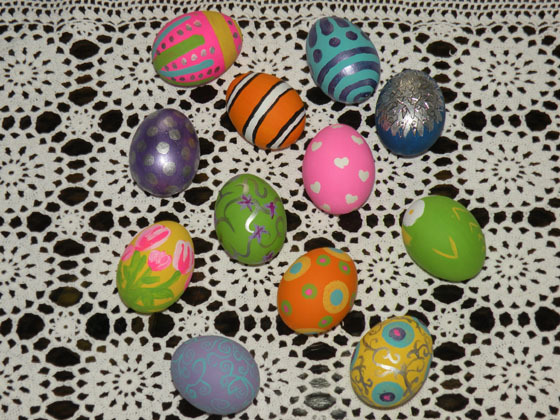 Creating painted eggs is not quite as simple as it looks. Start with one dozen white eggs. Then find a sharp needle and pierce each end of the eggs. Next is the hard part, blow into one end of the egg until you are left with an empty shell. Try not to break the shells during this process. Blowing the eggs is labor intensive. It seems like it is so easy but when you are doing a dozen of them it gets tiring. Discard the yolk and albumen. Next, rinse the eggs and let them dry overnight. The eggs must be dry or the liquid that remained inside may ruin your art work. A note of caution: If you plan to use more than one color on your egg then you must let the first color that you use dry completely before using the next color. Remember to rinse your brush well before using the next color. Using more that one color to paint your eggs is a time consuming process. 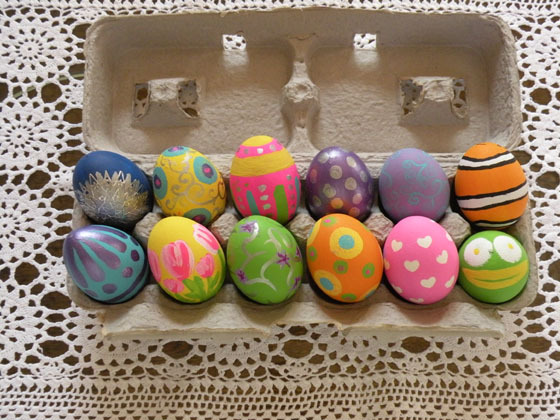 If you are painting a large number of eggs you may want to allot several days for this project. 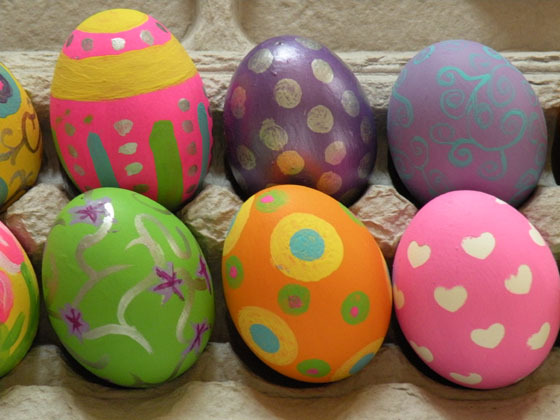 Before you begin painting it is best to have a general idea of what design or theme you want to paint on your eggs. Now you are ready to paint! A vast array of colors can be used to create endless possibilities for your designs. Allow the eggs to dry over night. You can package your eggs in baskets or in egg cartons. My daughters have been painting eggs for several years as gifts for our friends. This year they invited my little granddaughter to join them. She is only four years old but a very quick learner. She presented me with six eggs that she painted all by herself in a small purple sponge painted wicker basket. I have it lovingly displayed in my kitchen. I cannot wait to see what she will paint next year!